This adventive wasp is an ectoparasite of leaf mining fly larvae and comes from the Europe and North Africa. Wasps from Pakistan were released into New Zealand in 1970, though the species may already have been here. It is in both the North and South islands of New Zealand. 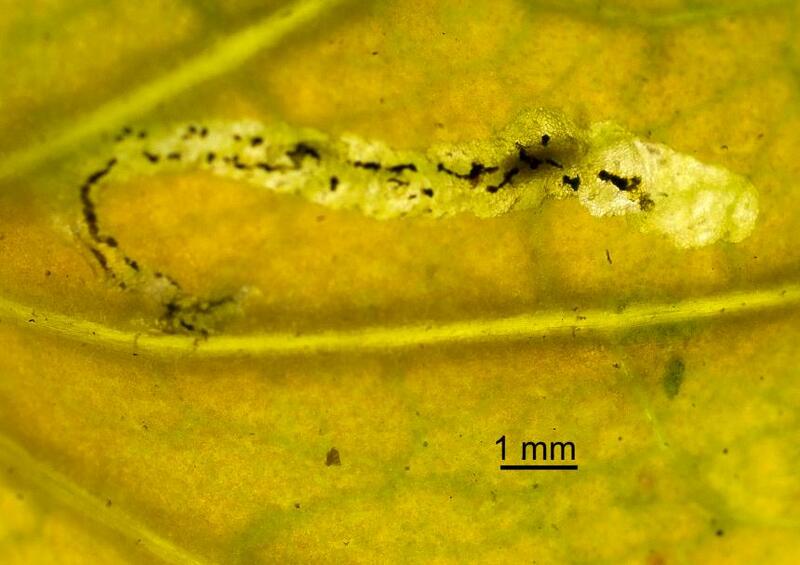 It parasitizes both adventive and native flies in the family Agromyzidae that make leaf mines in trees and herbs in non-forest habitats. Conservation status: Widespread in gardens, parks and open country areas such as marshes and shrublands. It contributes to the biological control of adventive flies that feed on native plants as well as parasitising native flies. The parasitoid breeds all year in Auckland, but in colder areas it has a resting stage (diapause) during winter. The adults are 1.5 - 2.0 mm long. 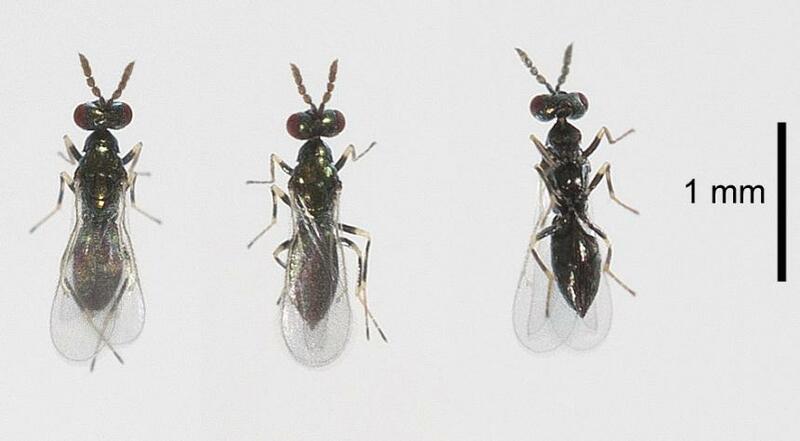 They are black with metallic green on the dorsal (top) of the thorax (middle part of the body). The legs (3 pairs) are also black, but have two or more white bands. The head has two dark red compound eyes and two short antennae are black. The two pairs of wings are transparent. The forewing has a strong vein on its front margin with a short cross branch. There are both males and females. The female has a yellow band on the hind leg. 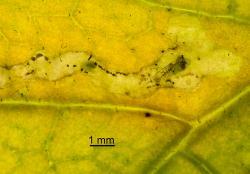 Female wasps locate fly larvae in leaf mines. They tend to feed on larger larvae. They puncture the larvae with their ovipositor and feed on the body juices. They can feed on over 200 larvae in their lifetime. 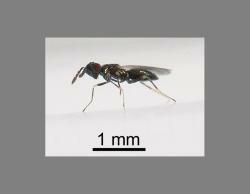 When the female wasp finds smaller larvae, they are first paralysed. Then a translucent, slightly curved cylindrical egg is laid next to a fly larva. Sometimes more than one egg is laid. A female parasite can lay between 100-200 eggs. Upon hatching a larva starts feeding on the fly larva from the outside. As the larva grows it moults (changes skin). 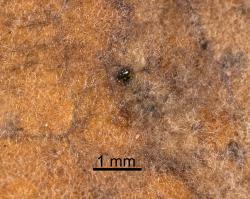 There are three larval stages (instars). The first instar is colourless and transparent, though it may turn pale green. 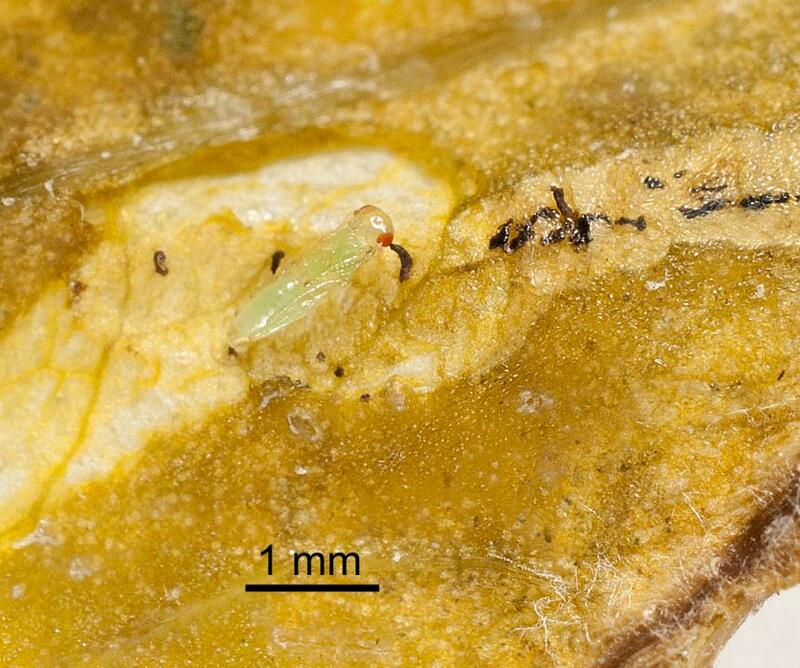 The second instar is yellow with a brown central long strip that is the gut or fat body surrounding the gut. Peristaltic waves can be seen passing down it. 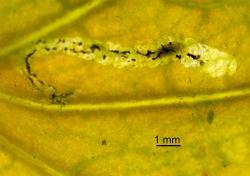 The last instar is blue green with a similar long, brown, central strip. The fully grown larva is about 2 mm long. When the wasp larva is fully grown it moves away from the dead fly larva skin. It pupates in the leaf mine. The pupa is initially white. The form of the adult body including the legs and antennae is visible. The wings are represented by short wing buds. 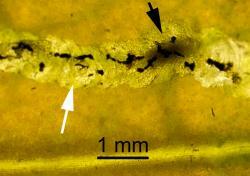 The pupa is surrounded by six black pillars of frass that keep the upper and lower surface of the mine apart. The first change noticeable in the pupa is the red compound eyes. Then shortly before adult emergence the pupa turns black. The adult emerges from the pupa inside the leaf mine. Then it chews a hole in the leaf mine though which it emerges. Koppert, the European producer of natural enemies for pest control, states that the time from egg to adult is relatively short. The parasite completes its development in less time than its fly hosts. At 15ºC it takes 26 days, at 20ºC 16.6 days and at 25ºC 10.5 days. 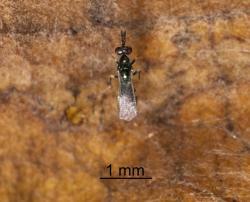 Adult Diglyphus isaea are tiny wasps and require expert knowledge for identification. Some characterist features are its tiny black slender body and black legs with white bands. The forewings only have a dark vein along the front edge and a small branch. 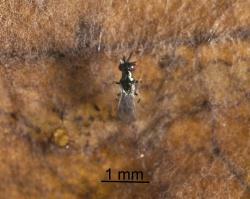 The species is one of several parasitoid wasps that kill small fly larva. 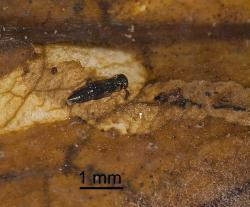 Characteristics of the species, but not unique features, are that the wasp larvae feed on the outside of the fly larvae, i.e. 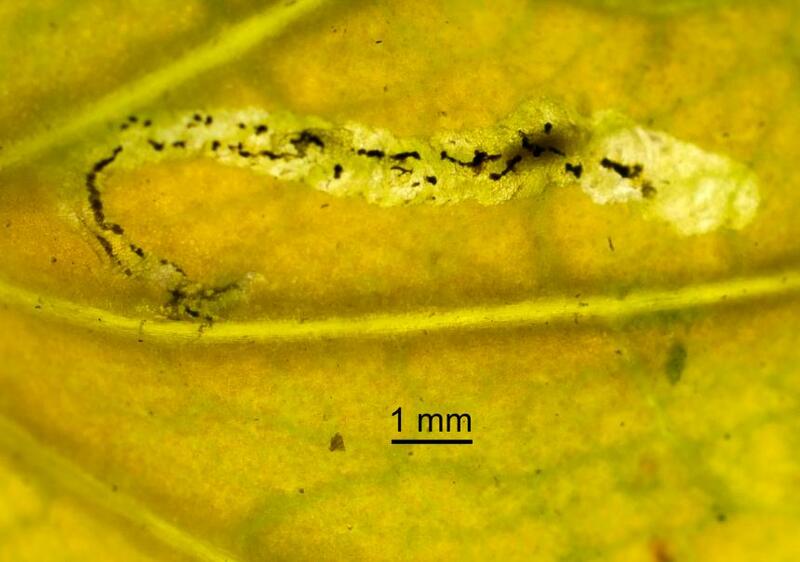 are ectoparasites and like some other parasitoids that pupate in the leaf mine, the pupa is surrounded by black pillars of faecal material to keep the upper and lower leaf surfaces apart. No pathogens, parasites or predators of Diglyphus isaea are known. The adults are probably caught by predatory insects and spiders. 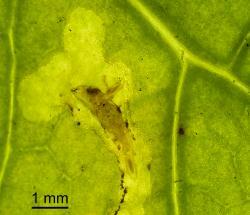 This ectoparasitic wasp has been recorded parasitising several species of leaf mining flies in the family Agromyzidae. 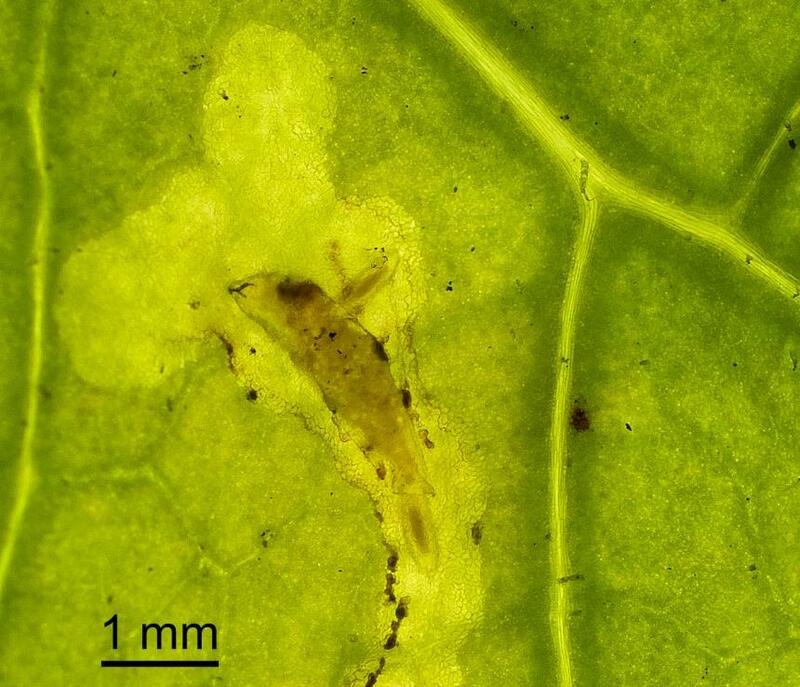 Female wasps locate fly larvae in leaf mines. They tend to kill larger larvae and feed on them. Smaller larvae are first paralysed and an oval egg is laid next to it. Upon hatching the larva starts feeding on the fly larva from the outside. A female parasite can lay between 200-300 eggs and kill many more larvae through host feeding. 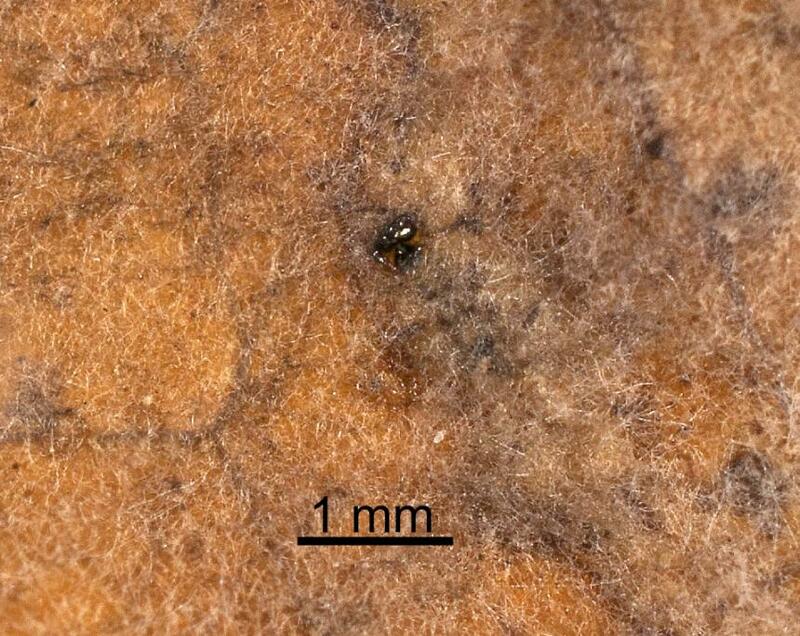 This makes this parasitoid an effective biological control agent in greenhouse crops in the Northern Hemisphere. Table: New Zealand hosts of Parasitic eulophid wasp, Diglyphus isaea, (Walker, 1838) (Hymenoptera: Eulophidae), from the Plant-SyNZ database (27 April 2017). The reliability score shows the quality of evidence for the host association (0-10, 10=high quality). In New Zealand and other countries the ectoparasitic wasp Diglyphus isaea (Walker, 1838) (Hymenoptera: Eulophidae) can contribute to the biological control of leafminer flies in outdoor crops where no parasite-harmful pesticides are used. 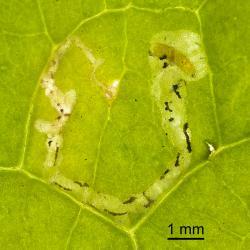 In New Zealand it also contributes to the control of adventive leafminer flies that feed on native plants, though it also kills native leafminer flies in native habitats. 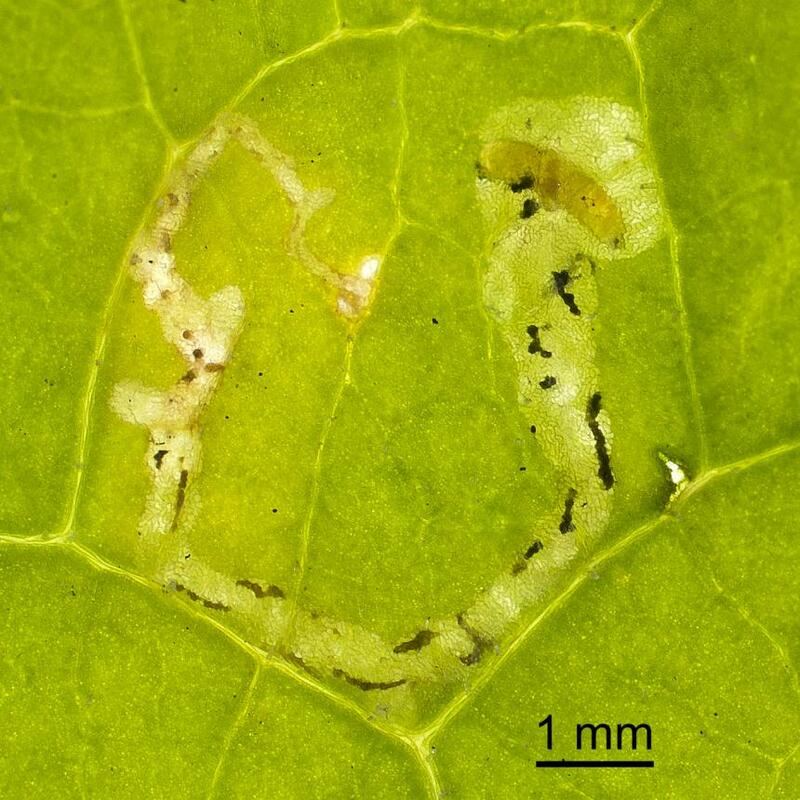 In countries that have severe pest problems with leafminer flies in greenhouse crops, the parasitoid, Diglyphus isaea, is one of several species that are mass produced for release into greenhouses to control the flies. 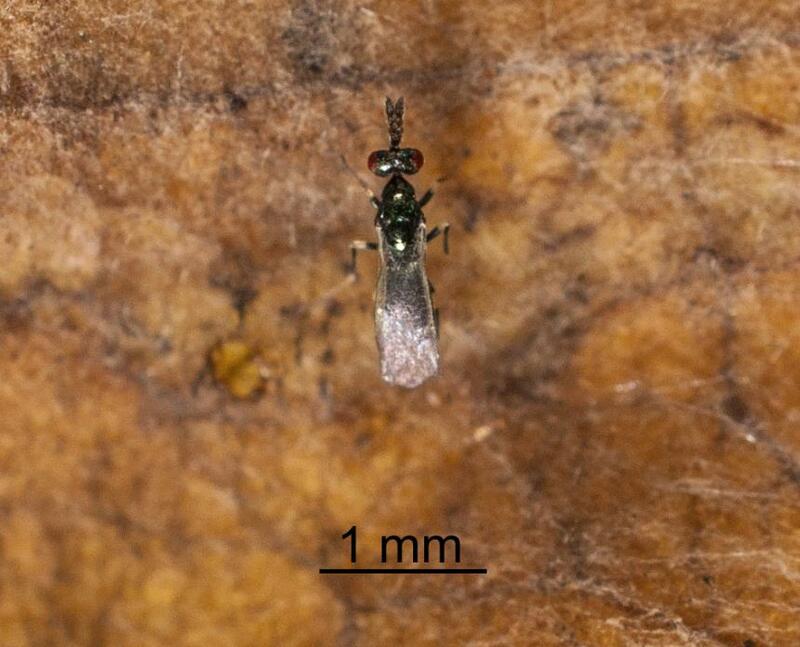 Adult wasps of Diglyphus isaea are released into greenhouses. As well as killing leafminer fly larvae by parasitizing them, Diglyphus isaea adult females feed directly on some fly larvae. They puncture the larvae with their ovipositor and feed on the body juices. They can feed on over 200 larvae in their lifetime. A female parasite can also lay between 100-200 eggs. Koppert, the European producer of natural enemies for pest control, states that the time from egg to adult is relatively short. The parasite completes its development in less time than its fly hosts. At 15ºC it takes 26 days, at 20ºC 16.6 days and at 25ºC 10.5 days. 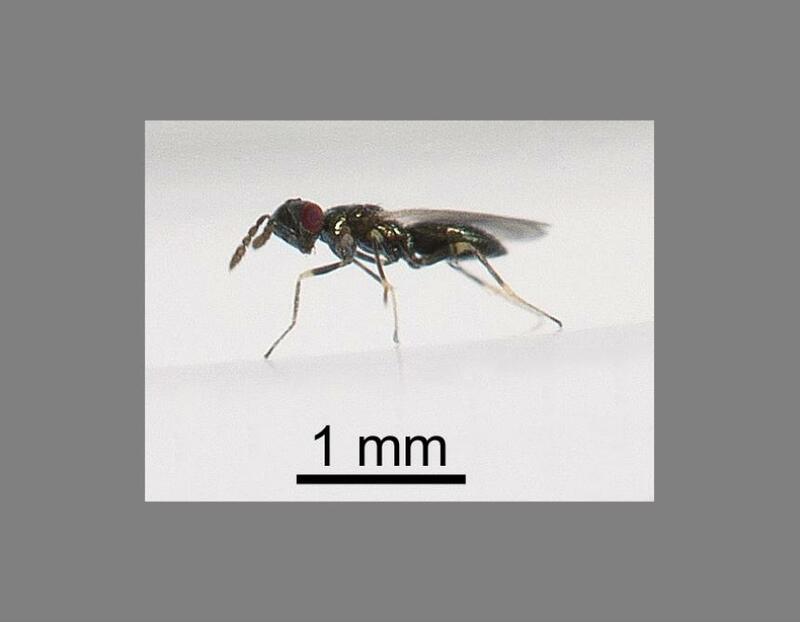 The parasitoid is particularly effective at controlling pest flies in summer. Malais M, Ravensberg WJ 1992. Knowing and recognizing: The biology of glasshouse pests and their natural enemies. Berkel en Rodenrijs, The Netherlands, Koppert B.V. 109 p.
Onillon J-C 1999. 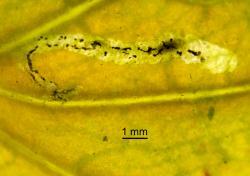 Biological Control of leafminers. In: Albajes R, Gullino ML, van Lenteren JC, Elad Y ed. Integrated Pest and Disease Management in Greenhouse Crops. Dordrecht, The Netherlands, Kluwer Academic Publishers. Pp. 254-264. 27 April 2017. NA Martin. Host table updated. Photographs upgraded to ensure enlargments of better quality. Martin NA. 2015, revised 2017. Parasitic eulophid wasp - Diglyphus isaea. Interesting Insects and other Invertebrates. New Zealand Arthropod Factsheet Series Number 19. http://nzacfactsheets.landcareresearch.co.nz/Index.html. Date Accessed. ISSN 1179-643X.